I am trying to embark on a healthier lifestyle. I have always worked out and watched my diet, but I am starting to learn more about the benefits of a more well rounded diet. I grew up in the era of Jane Fonda and low fat diets. I am starting to get the hang of using a little more oil in my diet. I completely understand that some oils are good for you, but I grew up with the "fat free" fad. My aunt has always been a fan of coconut oil. I remember her telling me for years how great this stuff is for your body. I still have a hard time just slathering on the stuff, but I am starting to take baby steps into the fat arena. I still think moderation is the key for me because of how my body reacts to fats. I think everybody is built differently and different approaches to diet are key to each person achieving their health goals. Besides, I HATE slick food. I do not like the texture of greasy food. So, for me...a little goes a long way! Now, on to the benefits (look here for details)...hair, skin, stress relief, weight loss (! ), fights heart disease (runs in my family), aids in digestion (boy do I need this), strengthens the immune system (always good), fights infections, it is even good for your bones since it aids in the absorption of calcium. I have really been focusing on why things are good for you. What does it mean for your body when you eat them. While I have baked with coconut oil, I have not really cooked with it before now. I loved this meal! It was so simple and so good for me! This was my meal to go along with the pulled pork dinner the boys had. I actually roasted the broccoli to get rid of the meat smell in the house as a joke. Trust me, it worked. Nothing stinks up your house like roasting broccoli, but it was so worth it! I loved the texture of the broccoli. It was kinda crispy on the flowery edges and tender on the inside. The carrots...oh my gosh...were divine! 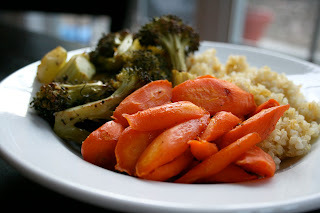 The coconut oil gives the roasted vegetables such a nice flavor (without a coconut flavor) and texture! Definitely give coconut oil a try! Preheat the oven to 400 degrees. Peel and slice the carrots on a bias. Cut off the florets of the broccoli and peel and slice the stalk. Place the vegetables on a sheet pan lined with parchment. Evenly coat the vegetables with coconut oil, salt and pepper. Roast for 30 minutes. Stir and roast for another 15 minutes or until desired tenderness. Serve up with your favorite protein. This looks delicious (as usual). I love roasted veggies, but usually stick to olive oil. Will have to give this a shot. I've recently started using coconut oil when I pan fry tofu. Gives it a much crisper, lighter fried texture than vegetable oil. Laura, I could not agree with you more. They did seem lighter and not like a heavy fry. You should fry your pickles in it!!! I can totally understand your fear of fat, but rest assured your body may be fine with the "right" fats. I've lost 15 lbs cooking with coconut oil and eating almond butter, nuts, and avocados.I wouldn't have believed it myself if I hadn't lived it (and lost it). That looks awesome - I love roasted vegetables! Yum! I have not roasted veggie with coconut oil before but I love it so I am not sure why not. I need to give it a try ASAP! 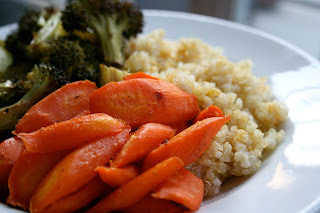 ive been loving coconut roasted veggies...so good and healthy FOR you, too! Thank you for the De-licious recipe. I have been using coconut oil for a few years now, but have not ever roasted veggies with it. I was looking for this exact recipe last week and your site was listed. Even a year later (2010>2011)I am glad your site is here. Thank You from Florida. [url=http://www.iystwowgold.com#wowgold]wow gold[/url], I'm a sucker for these kinds of games gold but the fact that they may work well.they are simply extremely adorable and i believe they can seem fine should go well with. At any time you sequence these online . We absolutley really like my bailey tab games gold.There're for that reason nice and chic! The [url=http://www.gw2golds.de]gw2 gold[/url] had been a gift from "Santa". There have been grievances that the games gold are too stiff and not as wonderful. I really like these games gold. They're incredibly fashion, and even Additional nice than the Classics in my opinion. The appear may be very excellent if you, like me, are much more of an outdoorsy person.